Hi & welcome to our beautiful Biewer terriers at West Bridge. 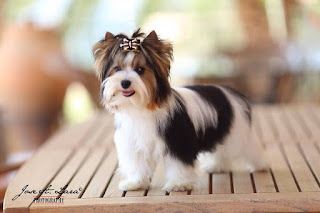 We are currently the only purebred Biewer Terrier breeders in the United Kingdom. Our interest in the Beautiful Biewer began back in 2007. We studied and researched these adorable little dogs, and like many others soon became addicted. We made friends with like minded doggy lovers and breeders, and waited patiently for just the right little Biewer dream babies to come into our lives. It is our sincere wish that every Biewer breeder works together for the betterment of this magical little dog. We hold dear the health & welfare of all our dogs, and this is no less important and indeed paramount to our breeding program working to establish only the best puppies for temprement, soundness, standard, conformation, quality, indeed healthy & happy little dogs. We are founding members of the BTCUK (Biewer Terrier Club of the United Kingdom) and it is our wish to take this new breed forward in the UK. We hope you enjoy looking through our site, please feel free to contact us, should you wish any further information or advice. When our pups are ready to go to their forever homes, we will notify here on this site, they are sold on a Contract Only basis & viewing is strictly by appointment only. Awww youur dog is so adorable!! I have a shitzu too and i love making her hair yes she is a her and she even sleeps in the best with me.